Populaire schoonheidsleer. De bevallige proportien der vrouw aangetoond door het proportie-beeld, geschonken aan de Rijks-Academie van Beeldende Kunsten. Aesthétique populaire. Le charme des proportions réguliëres de la femme. Expliquées au moyen de la statuette offerte à l'académie Néerlandaise des beaux arts à Amsterdam. Fock, Hubertus Cornelius Antonius Leopoldus, 1811-1894. Amsterdam : F. Buffa en Zonen, 1876. Description : printed wrappers, [3 l.] pl. ; ill.: 3 phot. ; 39.5 cm. Photograph : 3 large format albumen photographs mounted on cards, unbound. Photographer : Christiaan Marcussen (1822-1878). Subject : Human body — anthropometry. Author caption: Door H. C. A. L. Fock, medicinae doctor te Utrecht. Author caption: Par H. C. A. L. Fock, docteur médecin à Utrecht. Text in Dutch and French. Very rare, no copies located in OCLC. 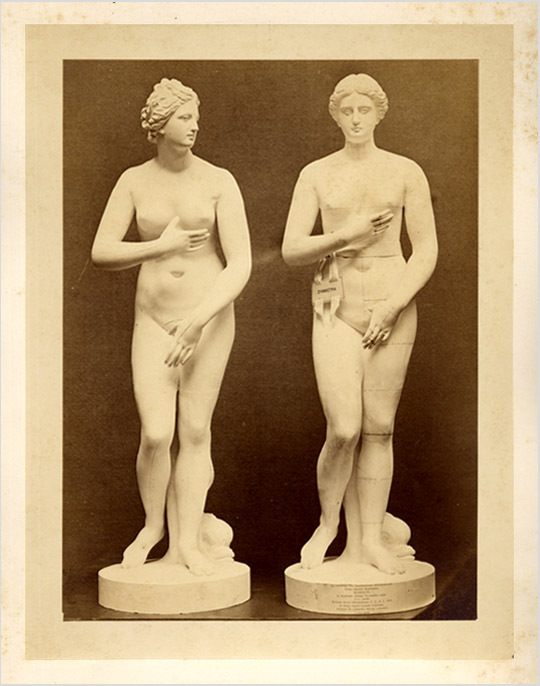 The photographs represent two replicas of the Venus de' Medici, one of them altered to demonstrate Fock's theories of ideal symmetry in the human form. The pedestal of the altered model is captioned in Latin, "Ex auctoritate Viri Excellentissimi Heemskerk Rebus Internis Neerlandicis Praefecti, in Academiae Artium Neerlandicae usum dono obtulit Medicinae doctor Ultrajectensis H. C. A. L. Fock, in denuo reperti Canonis Polycletici novaeque de symmetria theoriae aestheticai testimonium." Fock commissioned similar photographic studies to support his writings on the Doryphoros (spearbearer) by the Greek sculptor, Polykleitos. Anthropometry emerged as a discipline in ancient Egypt to help sculptors model and scale the human form. However, the concept that there exist ideal proportions to the human form originated in the workshop of Polykleitos, who used anthropometry to write his artistic canon and to guide the sculpting of Doryphoros, the "Polykleitos canon." Centuries later, the Roman architect, Vitruvius, demonstrated the value of anthropometry and the Polykleitos canon for designing and scaling the geometries of buildings and public monuments. The Vitruvius canon was immortalized by Leonardo da Vinci with his drawing, "Le proporzioni del corpo umano secondo Vitruvio." Both Albrecht Dürer and Pierre-Paul Rubens also published canons that are considered landmarks in anthropometry. Anthropometry began to inspire scientific inquiry around the time of Galen, but the first serious writing came from Johann Sigismund Elsholtz (1623–1688), who weighted a connection between disease and human proportions that are other than ideal, a theory that is implicit to the Polykleitos canon. Elsholtz was followed by Petrus Camper (1722–1789), who took comparative measurements of the facial angle, and Johann Friedrich Blumenbach (1752–1840), who pioneered the use of anthropometry in anthropological studies. Until the mid-nineteenth century though, whenever aesthetic anthropometry caught the attention of medical men, it typically excited the machinations of pseudoscience, as exemplified by the popular writings of Gall (phrenology) and Lavater (physiognomy). The aesthetic concerns of anthropometry were finally reined in by Lambert-Adolphe-Jacques Quetelet (1796–1874), who was the first to apply statistics to measurements of the human form, introducing the body mass index (Quetelet index), still in use today. After Quetelet, anthropometry that was powered by hard data made possible the creation of countless important subdisciplines in modern medicine and science. Notable nineteenth century practitioners of a scientific anthropometry include Topinard, Galen, Bertillon, Lombroso, Broca, and Marey.